Wholesaler of a wide range of products which include Industrial Glass Lined Reactors, SS Reactors, Used Glass Lined Reactors, Used Industrial SS Reactors and Used SS 316 M.S.Jacked Reactors. We are instrumental in offering our clients with Used Glass Lined Reactors that are available in various models and sizes at industry leading prices. All our reactors are widely appreciated by the customers for their longer service life, corrosion & abrasion resistance, sturdy construction and low maintenance. In addition to this, we check all the products on various parameters to ensure flawlessness. We are engaged in offering our clients a range of Glass Lined Reactors that are available with ms jacketed, propeller type stirrer along with electric motor, mono block type, baffle, gland packing, gear box and stuffing box. To fulfill the demands and requirements of our clients, we also provide spark test on our reactors for assuring about the flawlessness. 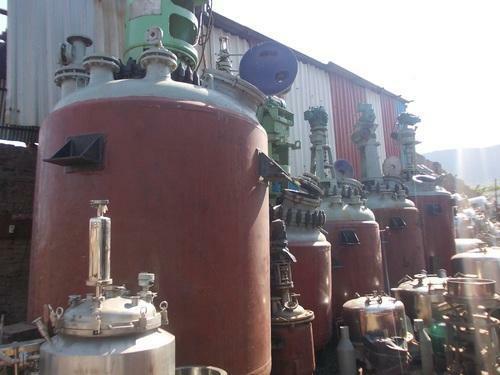 We also provide SS 316-304 reactor, jacketed reactors, chemical reactors, drier and blender. We bring forth for our customers a wide range of SS Reactors that are available in various capacities, models and sizes at market leading prices. All our reactors are designed and manufactured using superior raw material and latest technology at our vendors' end. We bring forth for our customers a wide range of Industrial SS Reactors that are provided in various models and sizes. All our reactors are designed using superior raw material and latest technology at our vendors' end. In addition to this, our reactors are known for their durability, reliability and less maintenance. Available in customized options, we provide these reactors at reasonable prices. Backed by our industrial experience of around 1 decade, we are able to offer SS 316 Jacked Reactors as per the industry standards. In addition, the array can also be designed as per the clients’ specifications and requirements. These are made from M.S, SS 304 and SS 316, titanium and nickel. Based on advanced tools and techniques, these products find wide application in various industries.